Historically, wallpapers were rarely designed to be used alone, and wallpapers would always have been paired with at least one border. Along with the multiple patterns on the wall it was also fashionable to paper ceilings from about 1850 up into the 1950s. The use of a single wallpaper in a room, or just papering one wall, is a fairly recent notion. In 2010 the Museum received a gift of two collections of French art deco wallpapers, one from 1928 the other 1929. While each of the collections is a mix of bold, intensely colored patterns along with more traditional designs, both collections illustrate the manufacturers’ intent for multiple patterns to be used together on the wall. The two patterns I’m showing here are a stylized floral design and a stripe. 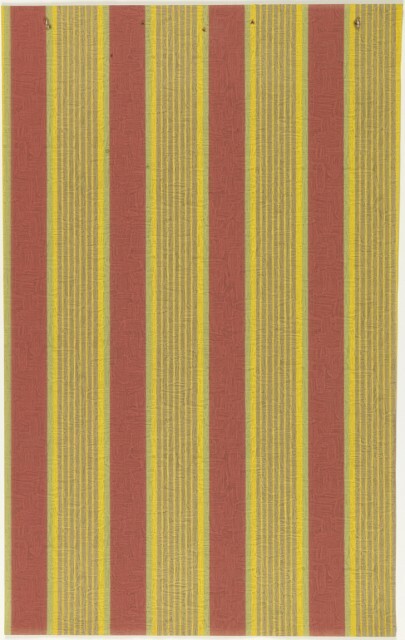 The floral design is printed in five colors: dark and medium reds, yellow, green and white, while the stripe pattern is printed in the same lighter red, green and yellow. Both are printed on identical embossed brown paper. The use of like colors creates a visual harmony, and while both patterns are strong in themselves, the extra colors on the floral along with its larger scale prevents them from clashing. The varying sizes of the cabbage roses and the small polka-dot pattern in the background create a nice sense of depth without being too heavy visually. Illustrations of room interiors show the more dominant pattern, in this case the floral, being installed as a border or frieze at the top of the wall. This allows one’s eyes to focus on the more sedate stripe paper, and makes it easier to hang artwork or photographs. While this fashion for using multiple papers in a room continued into the 1950s, the disparity between the two designs became more contrasting. The one pattern became mostly textural printed in tone on tone colors, while the companion paper would consist of a more robust pattern printed over this same textural design. While many wallpapers are beautiful by themselves, pairing them with companion papers and complementary borders brings out their true colors and adds a greater sense of depth to a room. Sidewall. France, 1928. Produced by J. Grantil Company. Gift of Carolle Thibaut-Pomerantz, 2010-31-105.